In the spirit of Easter, a classic recorded visit with the embodiment of love - Helen & Ellen of The Love Kitchen, Knoxville. Fred Sauceman shares news of the Elizabethton, TN Rotary Club Soup Bean & Cornbread Supper & Mary “Dee Dee” Constantine shares a recipe for deviled eggs with feta & olives on this episode of Tennessee Farm Table Podcast. Clint Smith of the Riverdale Community in East Knox County shares with us how he makes his small batch maple syrup. Ronni Lundy reads from her 2 time James Beard Foundation Award winning book entitled "Victuals, An Appalachian Journey with Recipes" . In celebration of the Spring season, and the joy of all of the fresh, spring greens growing, we hear Ronni read from the chapter of her book “Messing with Greens". This episode includes a visit with Farmer Jonny Buchanan who owns Crooked Road Farm in South Knox County, in Eastern Tennessee. He raises pasture raised eggs, and pork (which are not certified organic), and he raises certified organic produce. His products can be purchased at Three Rivers Market in Knoxville and he also hosts a CSA. Below is the link for his contact information. Fred Sauceman shares a “Pot Luck Radio” segment featuring Frederick Pal Barger - the man who created “Pal’s Sudden Service” restaurants in North East Tennessee and South West Virginia. Frederick Pal Barger started this chain of restaurants in 1956. On this episode I feature 3 recipes for Valentines treats. The first 2 come from Mary Constantine, Retired Food Editor of The Knoxville News Sentinel for Chocolate Cappuchino truffles and chocolate fondue, and the 2nd recipe icomes by way of Fred Sauceman with fun alcoholic Valentine drinks. I also have included a story as told by Bill Houston of Houston’s Mineral Well in New Market, TN - The story he tells is of Nettie Ivy a New Market, TN native who came up with the JFG Coffee tag line “The Best Part of the Meal”. And, I have news of 4 events involving the brand new seed library at the Blount County Public Library, in Maryville, TN. - a Slow Food Tennessee Valley event at Ijam’s Nature Center - and the 50th Anniversary Wild Game Dinner at UT Knoxville. Barry, Aliceson and Marshall Bales of Bales Farms in Mosheim, TN are Amy’s guests on this episode of The Tennessee Farm Table. A 6th-generation family farm in East Tennessee raising pastured poultry, lamb, pork, and beef with sustainable practices. Barry Bales has been a member of the band Allsion Kraus and Union Station for 30 years and winner of 15 Grammy awards, 22 International Bluegrass Association awards – including Bass Player of the Year 4 times, 1 Country Music Association award, and 2 Academy of Country Music awards. “Traditional New Years Day Good Luck Foods” from 3 different cultures on the latest episode of The Tennessee Farm Table - Appalachian Black eyed peas, collard greens and cornbread in the form of “Hoppin’ John” with Martha Boggs (Owner of the Bistro at the Bijou, Knoxville) - Asian noodles and greens and Lisa Smith’s Hoppin John Recipe with Mary Constantine (Food writer for the Knoxville News Sentinel) - And I’ll deliver a recipe for the Greek good luck Vasillapita cake. In this episode, we are setting the table with Cast Iron, and Cornbread, 2 staples of the Appalachian table. My guest is Dr. Katie Hoffman who describes how she and her husband rescue and rehab cast iron, make it brand new and well seasoned with their cast iron clinics and their cast iron rehab service. They call these sessions they hold in various locations of our Appalachian region “Cast Iron Clinics”. They also sell cast iron and ship it all over the country. Then, we are joined by Fred Sauceman from Johnson City with his “Pot Luck Radio segment” where we hear Larry Profit, owner of the Ridgewood BBQ in Bluff City, TN describe how the blue cheese dressing that they serve became it’s own, stand alone appetizer. Why do we all eat Pinto Beans in Appalachia, an Appalachian Culinary discussion with Ronni Lundy. It has to do the mining camps, labor wars, the company store, & food insecurity as told by James Beard Award winning Food Writer Ronni Lundy. - Fred Sauceman & his pot luck radio segment with Margaret Carr’s green and red pear salad. 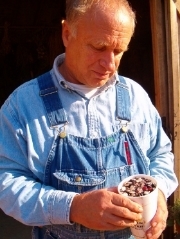 - Heirloom Seed Saver John Coykendall’s story about a fellow tired of eating beans. - And a short story from Heirloom Seed Saving John Coykendall of East Tennessee of a young man who was tired of eating beans. In this season of giving, I wanted to feature the good work of Second Harvest East Tennessee with Executive Director Elaine Streno. This organization serves 18 counties of East, Tennessee, and served 14.2 million meals this past year. 39% of those fed are children. Thank goodness for people who care enough about the suffering of other people to do something about it. Plus we have a story from Fred Sauceman from his pot luck radio series with Allan Benton describing how Allan makes his red eye gravy. - Mary “Dee Dee “Constantine has a delicious recipe for Mulled Cider . - Fred Sauceman has a pot luck radio segment on a former, historic annual event “Turkey Herding from Rural Hancok Co, TN” and a recipe with a twist on the usual for Turkey Picatta. Plus, I’ve got a cute little story involving a country doctor and a turkey egg from my own Daddy. Sponsor of The Tennessee Farm Table is Century Harvest Farms and Century Harvest Farms Foundation located in Greenback, Tennessee. In this episode, we are setting the table with a traditional, fall-time Appalachian culinary tradition. Sorghum. Sorghum is not Molasses. It’s a sweet syrup all it’s own derived from a grass plant and it is harvested, and boiled off every fall in September in our region. Sorghum has a different taste according to where it is grown, the dirt it is grown in, the region it is grown in, and how it is processed. Not all Sorghum tastes the same. In this show, we will hear from a cast of characters I’ve assembled here today to talk about this Appalachian “slow sugar” that is truly a taste, unique to our Appalachian region. - We hear from Fred Sauceman and a visit from his friend Dr. Mike Fleenor, an orthopedic surgeon who grows and makes sorghum and has a “sorghum boil” every year in Washington, County, VA.
- James Beard Award winning food writer Ronni Lundy tells us about the differences between sorghum, and molasses. - Mary Constantine Food Writer for the Knoxville News Sentinel shares tips on how to substitute sorghum in place of white sugar in cooking and shares a recipe for Butternut Squash and Apple Bake that uses sorghum by way of Ronni Lundy and her book entitled: “Sorghum Savor”. - And Chef Matt Gallaher of Amelia and Knox Mason shares a delicious way to enjoy sorghum with biscuits. and Century Harvest Farms Foundation located in Greenback, Tennessee. Seed Saver/Author Ben Cohen’s new book “From Our Seeds & Their Keepers”, A Collection of Stories. - The feature of this episode is an old time Appalachian tradition, saving seeds, particularly bean seeds. Seed saver Ben Cohen has written a brand new book entitled “From our Seeds and their Keepers”, A Collection of Stories, with forward written by Bill Best. We hear a story of a bean that Ben has saved and returned to the Cades Cove Museum in Blount County, TN that was originally from Kermit Caughen - one of the last people to live in the Great Smoky Mountain National Park. - Amy shares a soup bean recipe to share with you that might rival your Mamaw’s. - Fred Sauceman shares a segment on a variety of Appalachian beans, terms of Appalachian bean preparations, and a story of the “Noble Bean” that was saved by Seed Saver Bill Best of Berea, Kentucky. - Amy shares news of the 8th Annual Slow Food TN Valley Pie Contest to benefit the Eastside Farmer’s Market, Knoxville. Sunday, October 28th, 5 -7:30 PM. Location: Hexagon Brewing, Knoxville. - Fred Sauceman shares a story and recipe of Alvin C York’s favorite Egg Custard Pie. - Food Historian Fred Sauceman (from Johnson City, TN) shares the Native American history of the Cushaw Squash and a Cushaw pudding recipe. - Jill Sauceman shares cooking tips of how she cooks her Cushaw and handy tips to cooking, peeling, and preserving the Cushaw. - Amy Campbell share a delicious “Cushaw Pie” recipe (recipe below, keep scrolling). - A list of current events that are farming and local food focused. This recipe requires cooked Cushaw. Cushaw is not easy to peel, and a way to make this easier is to follow Jill Sauceman’s advice. She washed the Cushaw real well, pokes holes in it and roast the whole thing in the oven for about an hour until it is soft. She scoops out the flesh, removes the skin and seed and purees the cooked Cushaw in her food processor. She then freezes the pureed Cushaw until she is ready to use it for her pies. You can peel the Cushaw before cooking, but it is a job. - Stir together the mashed cushaw and cream; add beaten eggs. Mix well and add sugar, flour, salt, nutmeg, and allspice; mix well to blend. Blend in lemon extract and butter. - Pour mixture into the prepared unbaked pie shell and bake at 450 degrees F for 10 minutes. - Reduce heat to 350 degrees F and bake for about 40 minutes longer. Overhill Gardens, Monroe County, Tennessee with owner Avi Askey. Overhill Gardens is a Native plant nursery, and Eco-Friendly Landscapes, Hardscape, and design business. Amy interviews owner Avi Askey about his work for over 20 years now to improve region’s ecology through his work of saving native plants, and endangered native plant species. Appalachian Food writer Fred Sauceman: https://www.facebook.com/fred.sauceman shares a story with the voice of Janette Carter (daughter of A.P. Carter) and her Chow Chow makings. Great Smoky Mountain Food Days Event - This show consists of several guests who work hard to celebrate, elevate, and promote Appalachian foods past and present. - And our friend to the show Food Historian and writer Fred Sauceman from Johnson City, shares a “Pot Luck Radio on the Road” segment on a taste treat from he and his wife’s latest trip to New York City, a historic beverage experience that is one of his favorites called “Egg Cream”. - I’ve got a real big list of food & farming events happening in the vicinity, brought to us all by area not for profit organizations that are food and farming in focus. Appalachian PersimmonA biological perspective on the native Appalachian Persimmon tree and fruit with Charlie Kwit, Professor of Biology from University of Tennessee. - Mary “Dee Dee” Constantine with a recipe for Persimmon Bread by way of Morgan Simmons..
- Fred Sauceman with a “Pot Luck Radio” segment on Kentucky’s “Ale-1 8” soda pop. - Plus news of regional food and farming event. - Fred Sauceman shares a pot luck radio segment about his ETSU student Aynsley Porchak who is a grand masters fiddle champion in both the united states and Canada from Woodstock, Ontario and she describes her favorite dish “Poutine”. Amy visits with Katie Hoffman and Jean Haskell (Editor of the Encyclopedia of Appalachia) who are the ladies behind “Feastivals”, “A Celebration of Appalachian Cuisine & Culture” and is the culinary arm of the “Mountains of Music Homecoming Festival” . These 3 dinners take place June 9, 13th and 16th at 3 different locations in Virginia. Plus a huge list of food and farming related activities in the area presented by area non profit organizations. - A list of upcoming events that are food, farming, or agriculturally related presented by area non profit organizations. Century Harvest Farm Foundation is helping to rebuild lives with food and farming. We hear from Jen Patterson (Executive Director of Century Harvest Farms Foundation) and hear how they conduct their work and details about the open house happening 5/5/2018 from 12:00 Noon - 6:00 P.M.
Abbey Fields Urban Farm in downtown Knoxville, TN CSA sign up deadline is today (4/20/2018). Century Harvest Farms Grass fed, all beef salami made right on the farm in Greenback, Tennessee the old world way with months for curing, and no artificial preservatives. The farming method of pasture raised beef Century Harvest Farms employs, and details of the Century Harvest Farms Foundation. - Food writer and historian Fred Sauceman: https://www.facebook.com/fred.sauceman A complete list of news and events in the area presented by area non profits that are food, farming, or agriculturally related, and via the radio broadcast, a special Easter weekend bluegrass gospel Tennessee Farm Table program. Knoxville Chef Matt Gallaher of Knox Mason and Emillia Restaurants in downtown Knoxville, Tennessee. James Beard House, East Tennessee Dinner event, NYC, April 13, 2018. Daniel Eisenbrey from the Knox County Health Department on the topics of nutrition education, young farmer’s coalition, and the CSA Fair co-hosted by the Knox County Health Department and Nourish Knoxville. Fred Sauceman's Pot Luck Radio segment on Larry Profitt of Rideridge BBQ. “CSA Day” with Elizabeth Malayter, and a visit with Chef Travis Milton to hear about his new restaurant "Milton’s" which opened February 12, 2018 in St. Paul, VA.
December 24, 2017 Show Notes: An hour of Bluegrass gospel music and Fred Sauceman's segment on Egg Nog from his Potluck Radio series. -We have a story from Fred Sauceman from his pot luck radio series with Allan Benton describing how Allan makes his red eyed gravy. Buck Dancing, square dance calling, Christmas Tree farming Leo Collins with Blue Bird Christmas Tree Farm in Heiskell, Tennessee. Hear about BlueBird Christmas Tree Farm, Fred Sauceman's "Potluck Radio" segment with Allan Benton's Red Eyed Gravy recipe, and news and events round Knoxville this week of December 9, 2017. December 2, 2017 Show Notes - Food stories with Ronni Lundy, Robert Gipe, and Fred Sauceman. You can't eat a deposit slip by Ronni Lundy. November 25 - Amy featured an assortment of Bluegrass gospel and thanksgiving themed foods for the holiday weekend. -Rachel McCormick’s always juicy, always delicious brined turkey recipe. Recipe below. -Amy brings you tips on selecting the right size turkey for the crowd, thawing, brining, and cooking your Thanksgiving turkey. All of this information is written below. -Put salt, sugar, chicken stock in crockpot, allow to dissolve and then cool. -Place turkey bread side down in large container (food safe plastic, stainless steel, or a brining bag, or as Rachel used a paint bucket she bought from Lowes), pour brine and water over turkey. Brine for 6 - 8 hours depending on the size of the turkey. Or average 45 - 60 minutes per lb. in brine solution. -Remove turkey from brine over the sink. Discard the brine. Rinse the turkey inside and out and pat dry with paper towels. *It may turn this light blue color, that is OK, means you are doing it right. Don’t panic. 1 red apple (cut in 1/2 or quarters, 1/2 onion, 1 cinnamon stick, 1 c. water. Microwave all for 5 minutes and then stuff into bird cavity. Melt the butter and add all together, soak the cheesecloth in this mixture for a minute or 2, then drape over the turkey. *White wine tip use a DRY white wine. Sweet wine will burn the skin. Preheat oven to 500 degrees. Roast turkey for 30 minutes, then turn it down to 350 degrees. Let it sit there until it is done. (when the meat thermometer reads 160 degrees in the thickest part of the thigh. Pull it out of the oven. Remove the cheesecloth, cover with foil until ready. -If you are expecting a crowd (over 12 people, instead of buying a huge turkey, consider buying 2 smaller turkeys. The larger turkeys (say 15 pounds and over) can cook unevenly, possibly leaving you with very dry outer white meat. -They also can be so heavy, that they are more difficult to lift, and manage. -The smaller size birds are more likely to be in stock and the heritage and organic varieties come in smaller size birds. Fresh or frozen? : If you are planning on using a frozen turkey, be sure to allow yourself ample time to thaw it out. There are 2 different safe ways to thaw out the bird. Refrigerator or cold water thawing. If you use the refrigerator, it is easy, but takes more time. To thaw a turkey in ice water, you have to constantly change the ice water every 30 minutes, and rotate the bird to keep the temperature consistent and prevent bacteria proliferation. Thawing on the counter is not a good idea because of the uneven temperatures in the bird and invitation to bacteria growth. -Be sure the fridge temp is (40 degrees Fahrenheit or below). -Allow at least 1 day of thawing for every 4 lbs. of turkey. -Use within 4 days after thawing. -Change water every 30 minutes and if turkey cannot be completely covered, rotate every 30 minutes to keep the turkey chilled. Estimate a minimum thawing time of 30 minutes per lb. of turkey. Brining the turkey will make it more juicy. The primary reason to brine the turkey is to ensure the meat is moist as opposed to imparting flavor. First thing here is to be sure the container you are going to brine your turkey with will fit in your fridge. -Purchase a fresh turkey to eliminate the need to thaw, or completely thaw a frozen turkey. -The night before roasting, remove the giblets and turkey neck. Rinse the turkey inside and out.-Prepare your brine. Be sure to mix ingredients until all of the salt is dissolved. -If your brine is heated, be sure to cool it to room temperature before brining. -Place the turkey, breast down, in a large container made of food-grade plastic, stainless steel, glass, or a brining bag. -Add brine, covering the entire turkey. -Place in the refrigerator to let the brine do it’s thing. As a rule of thumb, you should brine your turkey 45 to 60 minutes per pound. -Remove turkey from brine after recommended time. Rinse and pat dry with paper towels. Cook turkey as desired. (For an unstuffed bird, it takes roughly 15 minutes per pound to cook.) If you want to cook a frozen turkey, it will take at least 50 percent longer than the recommended times. This information is from the USDA and is based on a 325°F oven, and a fully defrosted or fresh bird. *Be sure to remove the pack of giblets from the cavity before cooking. Basting: This does not make your turkey moist, it just makes the skin golden. Create a natural roasting rack for your turkey by layering carrots, onions and celery on the bottom of the roasting pan. Lifting the turkey off the base of the pan helps to increase hot air circulation around the whole bird so that it will get crispy all over. And the vegetables add great flavor to the gravy. How to tell if the bird is done? -Put a meat thermometer in the ticket part of the thigh (don’t let it hit the bone) when it reads 165 degrees, it is done. -If you do not have a thermometer, pierce the thigh with the point of a sharp knife, and if the juices run clear it is done. “The Wild Persimmon of Appalachia” (Diospyros virginiana) - Biology of, with Charlie Kwit , Winter weather predictions with persimmon seed with Crystal Wilson, Persimmon Bread recipe with Mary Constantine (Food Writer for the Knoxville News Sentinel), and the excitement of receiving a 50 lb. bag of Kennebec potatoes from a friend with Jill Derting Sauceman. Martha Kern of Strong Stock Farm in Knox County, Tennessee. Martha and her family own and operate a 900 acre farm where they raise Angus cattle for beef production. She has been working on this herd since 1948 and they have been raised on grass only. Her products can be found at Three Rivers Market in Knoxville and served from the Savory and Sweet food truck in Knoxville as well as Good Golly Tamale, Knoxville. Live on air fund drive with special guest Jack Neely (Executive Director of the Knoxville History Project) and the History of Market Square, and the Farmers' Market in Knoxville, Tennessee. Gatlinburg, Tennessee residents Allyson and Chris Virden have come up with a proprietary pepper blend called "Olde Virden's Red Hot Sprinkle". Hear their story. East, Tennessee proud. Mary Constantine (Food writer for the Knoxville News Sentinel) shares a spicy, honey, almond butter recipe. Peg & Sue, Co-Owners of Cowgirl Creamery. These two women let us know about their business, and thoughts on whole, good foods. They attended the University of Tennessee and now want to give back to this region by helping to support regional agriculture and hospitality concerns. One way they are doing this is by sponsoring the 1st Annual Great Smoky Mountain Food Days Event. This is an event that celebrates the food, culture and agriculture of our region. A visit with food writer Sheri Castle on her work, cookbooks, and feelings on Southern Comfort Food. Plus her topic as key note speaker at the Great Smoky Mountain Food Day Event, October 6 & 7 in Knoxville. -A visit with Jeffrey Dealejandro on "The Long Table Dinner" taking place September 24th in the Old City in Knoxville to benefit CSA Beardsley Farm in Knoxville. Mary Phillips of Friendsville, Tennessee shares with us wisdom on canning, marriage, white half runners and peanut beans. Fred Sauceman tells a story about heirloom seed saver Bill Best, and beans. A visit between cutting hay on a hot summer day with Cruze Dairy Farm's Earl Cruze & Colleen Cruze Bhatti in East Knox County, Tennessee. We visit with Christine Collins who will let us know about a craft brew festival upcoming in Maryville TN called Hops in the Hills - this is a celebration of fermentation where science and agriculture meet. Christine is part of a group of people who work to make this festival happen. Hops in the Hills is a not for profit organization that strives to promote Tennessee agriculture, brewing and hop production. Who was JC Holdway? Why is Chef Joseph Lenn's restaurant named after his Uncle Joe? This podcast is a visit with James Beard Award Winning Chef Joseph Lenn along with Joseph's Mother (Emily Lenn), and his Grandmother (JC Holdway's sister, Juanita Evans). We hear their memories of Uncle Joe, and the inspiration behind the restaurant JC Holdway. The restaurant is owned and operated by the James Beard Award winning Chef Joseph Lenn. PUS! Fred Sauceman shares a Chow Chow recipe that he learned in the kitchen of Janette & Joe Carter family in Hilton's Virginia. 2 time James Beard Award winner Ronni Lundy reads “Messin’ With Greens”, from her book “Victuals” And we also visit with Chef John Fleer, of Rhubarb, Asheville, NC. *Be sure to enter your name in the hat to win 2 free tickets to this event! Fred Sauceman with Mother's Day, Strawberries & Wayne Scott (Strawberry farmer). Ronni Lundy (James Beard Award winning Author for cook book of the year for her book “Victuals”) with her story about “Drive in Strawberry Pie”. Fred Sauceman on strawberries, Wayne Scott, and Mother’s Day. Dee Dee Constantine and Strawberry Jam Recipe. David & Linda Lay on farming strawberries and playing traditional music. Plus news on the @Nine lakes Wine Festival & ticket drawing. Amy visits with Dr. Chris Sneed, PhD, Extension Specialist, UT Extension Institute of Agriculture, University of Tennessee. We discuss the program developed by Dr. Sneed and Janie Burney, PhD, RD called “Farm Market Fresh”. The primary objective of this program is to encourage fruit and vegetable consumption by limited-resource families. By using their SNAP benefits at farmers’ markets accepting EBT, families can have greater access to fruits and vegetables and learn how to select, prepare and store them in healthy ways. -Fred Sauceman's story about Red Bud Jelly from Johnson City, TN. -Dr. Campbell fishing tip according to the budding of the red bud trees from Knoxville, TN. -2nd Annual Appalachian Fest (Cornbread, apple cake, singing, poetry, and storytelling). Date: 4.1.2017, Time: 5:30 p/m/ - 9 p.m., More information Facebook. • Fred Sauceman's story about Red Bud Jelly from Johnson City, TN. •Dr. Campbell fishing tip according to the budding of the red bud trees from Knoxville, TN. •A beautiful gospel song from Jeff Barbara & Sarah Pirkle of Blount Co, TN. •And news of events in our Tennessee region. •Nourish Knoxville, East TN farmers CSA Fair 2017! March 30th, from 4 - 6 p.m. At the C.W. Cansler Family YMCA, Knoxville, TN. JEM Farm, Nourish Knoxville CSA Fair: A visit with Elizabeth & John Malayter from JEM Farm, Rogersville, TNand learn about the products they offer and the CSA they offer. Also, hear news of the upcoming Nourish Knoxville CSA Fair, March 30th. Seed Saving & Stories with our ole seed saving pal John Coykendall of Knoxville, TN. John tells us how he became a seed saver, some of the varieties he has saved, where to find old time heirloom seed like the ones he saves, and shares some cute stories. -The Community Supported Agriculture Fair “CSA Fair” Thursday, March 30 4:00 P.M. - 6:00 P.M. Located at the C.W.Cansler Family YMCA 616 Jessamine St, Knoxville, TN 37917. -The Grow Your Garden series! Participants will learn about growing a fruits and vegetables this spring and discuss what to plant, when to plant it, and how to grow a spring edible garden. Pre-registered participants will take home seeds and starter plants provided by CAC Green Thumbs and the Center for Urban Agriculture. The Grow Your Garden series is offered through the Center for Urban Agriculture as a partnership between the Knoxville Botanical Garden and Arboretum, the Phyllis Wheatley YWCA, and SEEED Knox in an effort to help people grow food for themselves and others. -Blount County Bee Keepers Association meets the 2nd Monday of each month except for the months of September and December, at the Blount County Public Library, Sharon Lawson Room. Contact President Dennis Barry at (865) 414-2116 or barrybuilders@hotmail.com for more information. -Spent grain pick up: Looking for a farm or beef operation that feeds grain to pick up 250 Lbs. 2 x a week of spent corn used in the distilling process from Jefferson County, TN. If you can use this resource for organic material for your operation, please email me (Amy) @ creativecampbell@gmail.com and I will put you in touch with the person who is looking to off load this spent grain. -Mary Constantine, Food writer from The Knoxville News Sentinel shares Lisa Smith's Hoppin' John recipe with us as well. Lisa Smith owns and operates "Big Fatty's" in the Bearden area of Knoxville, Tennessee. Bigfattyscatering.com. December 24, Show Notes: Amy played a whole hour of Bluegrass Christmas Music on WDVX.com. Mike McGill’s Christmas Spectacular (a benefit for 2nd Harvest Food Bank) Sunday, Dec.18, 8 p.m., Location: Barley’s in the Old City. $5.00 per person. More information: www.reverbnation.com/mikemcgill or by phone: (865) 521-0092. Here is a listing of ways we can allhelp the East Tennessee Victims of wildfires and the latest McMinn County tornado. Rachel McCormick from Knoxville and her “always juicy, always delicious brined turkey recipe”. Plus, a listing of ways we can allhelp the East Tennessee Victims of wildfires and the latest McMinn County tornado. November 26th Show Notes: Mulled Cider Recipe from Mary Constantine, Fred Sauceman on a Turkey dish variation. East Tennessee singer songwriter duo Sarah Pirkle & Jeff Barbara with a beautiful gospel song. Connect with Jeff & Sarah here through facebook. Mary Constantine shares an old fashioned Black Walnut candy recipe and memories of Shirley Mcmurty of Manardville, Tennessee plus Amy shares other seasonal recipes. Apple Butter time in Appalachia: Apple Butter making with Crystal Wilson, Fred Sauceman& Robin Payne Nov. 5th on The Tennessee Farm Table Podcast & Broadcast. Plus, Chef Shelley Cooper (of Dancing Bear Lodge Appalachian Bistro) tells us what she is cooking up for the https://www.facebook.com/Townsendgrainsandgrits/?fref=ts happening Saturday, November 5th. -Chef Shelley Cooper (Dancing Bear Lodge & Appalachian Bistro) with her foods she is cooking for the Grains & Grits Festival in Townsend, Tennessee November 5th, 2016 & her feelings on the southern staple, soybeans. -complete list of our local farmers markets along with seasonal hours, and dates during this tail end of the growing season. Show Notes: Food Preservation & the “Canning College” with Dr. Christopher Sneed. We speak on safe practices in canning and how you can get involved with the “Canning College” program that Dr. Sneed created. Amy also has a list of the last opening dates of our regional farmers markets in and around Knoxville. Grassy Creek Soap Co. Phone: 865-293-9591. Thank you to Mary Alice Phillips and her information on canning beans. -Cancerpalooza, A Farm Benefit to Benefit Carrie Niceley information. July 23, 2016: Pickle Fever! Overnight refrigerator pickles: Food Historian Fred Sauceman shares a recipe for overnight pickles that he received from Lynn Tolley, the great grand nice of Jack Daniels. This pickle is served at Miss Mary Bobo’s Boarding House, in Lynchburg, Tennessee. 295 Main St. Lynchburg, TN. Phone: (931) 759-7394. Bread & Butter Squash Pickles, Old Alabama Recipe by way of: Linda Rogers Weiss. Her blog is called Southern Cooking at Home and it is full of classic, southern recipes! Mary Constantine, Food editor of the Knoxville News Sentinel shares great canning tips. "Country Doctor Story" from Amy's well known and beloved Father (Dr. John Campbell) to commemorate his 88th Birthday, Sunday July 24th. Fruit Cobbler Festival, at Riverfront Park in the City of Harriman, Tennessee tomorrow from 5 pm until 8 pm. With Arts & Crafts, a cobbler competition, live music & a movie at sundown. There is no charge for admission, but there is a small charge to sample cobbler. More information here. CAC Beardsley Community Farm would like to invite you to to support your local non-profit urban farm: Our Beat the Bugs With Bugs class will be taught by Master Gardener, Amy Haun. The class will cover the basics of pest management in the garden and how to introduce beneficial insects. The class is free and open to the public. The class begins at 12:15 and goes until 1:30 pm. More information here. “Cancerpalooza” Farm Festival to benefit Carrie Nicely.Sunday, July 31 from 4:00 - 10 P.M. Location: Strong Stock Farm, 8220 Rutledge Pike, Knoxville, TN. 37924. More information here. July 16: Bacon & the Bear, Spiced Blueberry jam, Blackberry Dumplins. -Mary Constantine with a recipe for spiced blueberry jam. -Robin Payne with guiding us along to make blackberry dumplins. Simmons Bank, 710 S. Foothills Plaza Dr, Maryville, TN 37801. July 9: Chef John Fleer, an early pioneer of the whole farm to table eating phenom. Amy visits with Chef John Fleer of Rhubarb, Asheville, NC. July 2: Cobblers, Cobblers, Cobblers! June 18: Hops in the Hills Craft Beer Festival, June 25th, Maryville, TN (a celebration of fermentation) Amy’s feature this Saturday @ 9 am WDVX with guest Christine Collins.https://www.facebook.com/hopsinthehills/ Hops in the Hills is a not for profit group that is committed to growing our agricultural & regional economy through fermentation. And Mary Constantine brings to us Chef Edward Lee's Sorghum & Grit Ice Cream recipe from the cook book written by Ronni Lundy entitled Sorghum Savor. May 21 & 28: Roy Milner of Blackberry Farm Brewery. Where he is from, how he got into the world of beer, and Blackberry Farm Brewery's Classic Saison Beer. This beer brought home a gold at the 2016 World Beer Cup Competition beating out over 115 other French & Belgian style Saison beers from all over the world. The brewery is located in Blount County, Tennessee. The brew master's name is Daniel Heisler. May 14: It's 2016 International Biscuit Festival time in Tennessee until Sunday! Sat. May 14, Amy broadcast the show @ 9:00 on 89.9 fm WDVX.com in Knoxville. Amy of The Tennessee Farm Table Radio Show & Podcast visited Matt Gallager of Knox Mason restaurant. Matt was one of the panelists at the Southern Food Writers portion of BiscuitFest (along with Joseph Lenn). Mary Dee Dee Constantine food writer at the Knoxville News Sentinel shared biscuit moments with us and a recipe for "Touch of Grace Biscuits". This Saturday, April 23rd @ 9:00 A.M., Amy visits the opening day of the Maryville Farmers' Market w/ crafts on the Tennessee Farm Table radio show & podcast. We also have a visit from Karen Shankle's & her prize winning recipe from 2015 (Karen is a 2 time winner of the National Cornbread Festival). The National Cornbread Festival happens this weekend April 23 & 24th! Plus Mary Constantine (who is both a competitor & judge in several "cornbread heats" during this year's cornbread festival) If Mary looses, she wins monies for 2nd Harvest Food Bank, if she wins, she wins even more monies for 2nd Harvest Food Bank! Mary Constantine (food writer for the Knoxville News Sentinel) shares her respect for the importance of a 4-H contest she entered as a child. The cornbread festival is heavily involved with 4-H programs. April 9, 2016, Show Notes: The 2016 Spring Blount County Cattle Show. This radio show & podcast features the endeavors of our future farmers from area schools in East Tennessee.The Cattle show is Saturday, April 9, 2016 beginning at 12:00 Noon at the Heritage High School Livestock facility, in Blount County, Tennessee. When you are on campus, look for the big red barn. That is the location of this event. For more information on how to get involved with the work going on at the Heritage Livestock Facility, your contact is: Jon Waters - jon.waters@blountk12.org. Setting the table with: A good old fashioned Hoedown, Coffee as steak seasoning with Mary Constantine , Surprise muffins, and gospel music from Sarah Pirkle & Jeff Barbara. These students and teachers will be my special guest this Saturday on The Tennessee Farm Table. Really hope you can join us for the Hoedown and the show which describes the work of this educational program. If you are unable to attend the fundraiser, contributions can always be directed to keperley.camet@Blountk12.org, or jon.waters@blountk12.org. Old time mountain granny doings concerning springtime with Crystal Wilson of Turtle Mountain Herb Farm tomorrow on The Tennessee Farm Table. It's spring time in Tennessee and the red buds are in bloom! Appalachian food writer Fred Sauceman has a red bud jelly recipe from the late great Minnie Curtis of the Clinch Mountains. Plus Mary Dee Dee Constantine has a delicious recipe for Spring Onion Soup. We had Allan Benton of Benton's Smokey Mountain Country Hams in Madisonville, TN and Peggy Hambright owner and operator of Magpie's Bakery in Knoxville live on the air as part of the WDVX.com spring fundraiser. Thank you Allan & Peggy for your support! Bill Houston narrates the story of Houston's Mineral Water, New Market, Tennessee - still going strong since 1931 - Bill Houston is the the owner and operator of this Mineral Well that his Grandfather established. Honey for your "honey" - We will talk about Bees, Beekeepers and how important these creatures are to our food system. We also feature several items made by local beekeepers that make great Valentine's Day treats. Here is a list of resources to locate local beekeepers, their products and businesses that sell their products. -Call ahead before driving long distances to confirm availability, address, and hours of operation. Memories of JFG Coffee, Knoxville, Tennessee. With guests are Tinah Utsman, daughter of "Coffee Jack" Utsman who was president of JFG Coffee for 20 years. Tinah, a Knoxville treasure herself is a photographer and supporter of good things such as friends, family, children who are in need, and homeless dogs. connect with her on Facebook here: https://www.facebook.com/pages/TRU-Dog-Network/195219860507511?fref=ts This is a picture of her father "Coffee Jack" with his dog "Grip" as a child in Rogersville, Tennessee. Coffee Jack was President of JFG Coffee for 20 years. Let's dream of spring and ramps. Fred Sauceman's fabulous documentary is featured. Flag Pond, Tennessee Ruitan Club's Annual Ramp dig and many of the members talk about Ramps. Connect with Fred Sauceman on Facebook. Fred Sauceman is a Tennessee treasure, he loves to collect the history of our foods and people. Apple Cider. Diane Flynt, co-owner of Froggy Ridge Cider FoggyRidgecider.com (Dugspur, VA) is our our feature. She states we should be as concerned with what is in the glass as we are with what is on the plate. Diane was recorded during the Appalachian Food Summit, September 2015 by Amy Campbell of The Tennessee Farm Table. Connect with the Appalachian Food Summit working group on Facebook. *Please note, this is not the poisonous sumac. Staghorn sumac has velvety red berries. The poisonous sumac often has white berries. Please be sure you can positively identify wild plants before consuming any wild plant. See images below. -Mary Constantine, Food Writer for the Knoxville News Sentinel with a warm and yummy recipe for Vietnamese Beef Stew. Mary Constantine, Food writer from The Knoxville News Sentinel shares Lisa Smith's Hoppin' John recipe with us as well. Lisa Smith owns and operates "Big Fatty's" in the Bearden area of Knoxville, Tennessee. Bigfattyscatering.com. A collection of Bluegrass gospel music to celebrate the Christmas weekend. Michael Colquitt, owner of Bread of Heaven BBQ, Alcoa, Tennessee, catering and food truck. Beginning deliveries in January. One of the best BBQ places around, hands down. Find him everyday in the Big Lots Parking lot, Alcoa, TN. Revisit with the sisters Helen & Ellen of The Love Kitchen in Knoxville, Tennessee. These sisters feed people in need. Their motto is "Everybody is God's Somebody". -Mary Lynn Snyder shares with us her mother Ruby’s favorite holiday recipe for Creamy Lemon Pie. -Mary Constantine (Food writer for the Knoxville News Sentinel) presents a story about the life of Sarah Ann Geer McIntyre. Sarah was the cook at the hotel in Saltville, Virginia and Mary shares a bit on the life of Sarah and Sarah’s pound cake recipe. This would make a classic Christmas time dessert for your table. During the Appalachian Food Summit in September, Ronni Lundy, Nancy Bruns and Amy Cameron Evans presented on “Salt”. One of the topics was the “Saltville Centennial Cookbook”. This woman’s life and recipe come to us thanks to Ronni Lundy and the good people who worked so hard to create the Appalachian Food Summit. -Do you all remember Miller’s Department Store downtown Knoxville? We have the neatest little story and recipe from Sarah Pirkle’s sister Donna about “Mauzy’s fruit salad” that has to be on the Christmas table or it just is not Christmas in the Pirkle family. We are proud as we can be of Sarah Pirkle and Jeff Barbara, and the authentic music they write and play from the heart of East, Tennessee. Sarah’s brother Andrew Pirkle (of Barstool Romeo fame) is also a big musical talent. Donna’s grandmother Margaret Perry Finley and possibly her mother too used to work at the Polly Anna Tea Room at Miller’s Department store in downtown Knoxville where this was served. Mother says start with 5 red apples and cut them in to bite size chunks. Do the same with 6 oranges and 6 bananas. Add a can of pineapple chunks, drained. Stir in ¼ to ½ cup of sugar if additional sweetness is desired. And that is it. Simple but delicious. Mauzy's fruit salad. December 5: Sorghum in Appalachian Cooking. -Ronni Lundy and her book Sorghum Savor. Ronni is a well known writer of music, food & culture. She has worked for years with the Southern Foodways Alliance and is a driving force behind the Appalachian Food Summit. Follow Ronni on Twitter@RonniLundy. -Fred Sauceman covers his new documentary Sunlight Makes it Sweeter, A Story of Sorghum. Follow Fred on Facebook and Twitter by using his name. -Mary Constantine, Food Writer of the Knoxville News Sentinel has a recipe from Ronni Lundy's book - Butternut Squash & Apple bake with sorghum and bacon. Follow Mary on Facebook or Twitter by entering her name. November 28: Amelia Geis-Scott. Amelia feeds an average of 350 hungry people 2 times a week in Blount County, Tennessee at 2 churches at no cost to the guests in a ministry called "The Welcome Table". Everyone is invited to come and share a meal. Links to the 2 churches that offer this are New Providence Presbyterian Church : http://www.newprovidencepres.org/welcometable and First Methodist Church, Maryville: http://www.1stchurch.org/#/1st-to-serve/welcome-table The menu hot line is:865-681-0804. -Mary Constantine has a segment and recipe on a traditional Mincemeat. -Fred Sauceman has a fresh spinach side dish recipe. November 21: Appalachian Thanksgiving recipes including sweet potato casserole and stuffing. Our feature interview is Mary Lynn Snyder originally from Harlan Kentucky. Mary Lynn remembers her mother Ruby's recipes and traditional ways of cooking while growing up in the R.C. Tway Coal Mining Camp in Harlan, KY.
November 14: What kind of winter are we in for this year? Crystal Wilson of Turtle Mountain Herb Farm (our frequent contributor) tells us what to look for in the natural world for clues on the winter weather. We also will look at the good ole Farmers' Almanac. -Fred Sauceman has a segment on Apple butter. November 7th : "The MAN on HAM, bacon, sausage and all things pig", Allan Benton of Benton's Smokey Mountain Country Ham from Madisonville, TN will be our guest on The Tennessee Farm Table Radio Broadcast and Podcast. October 17th at 9:00 A.M. The Tennessee Farm Table Show with the subject of "SALT". We visited with Nancy Bruns of the J.Q. Dickinson Salt works. This 7th generation salt-making family harvests an all-natural salt by hand, from an ancient ocean trapped below the Appalachian Mountains of the Kanawha Valley in West Virginia. We featured this to serve as an example of a progressive, Appalachian, agricultural enterprise with an eye on sustainability. We also will featured the art of Amy Cameron Evans. She illustrated the stories found in the "Saltville Community Cookbook" and was Artist in Residence at the Appalachian Food Summit. Connect with Amy on Instagram and Twitter from her website http://www.amycevans.com. She has a large assortment of prints and paintings to choose from. Amy Evans Art. View the work from the Saltville Cookbook on her Instagram page. CORNBREAD and special guest Ronni Lundy on "The Tennessee Farm Table this Saturday Oct. 10 9:00 - 10:00 A.M. on your FM radio dial at 89.9. WDVX in Knoxville and online from anywhere LIVE on the computer at WDVX.com. Miss the show? Listen on YOUR schedule to this show after 10 AM October 10 www.TennesseeFarmTable.com or as a podcast on itunes. Ronni Lundy is a big deal in the world of food and food writing. She edited "Cornbread Nation 3" with The Southern Foodways Alliance - Her books regale Appalachian and Southern people and their dishes Hope you can hear this fabulous person give her take on CORNBREAD! -"Paw Paw Fruits". We visit with Author Darren Nordahl, Author of the book "Eating Appalachia, Rediscovering Regional American Flavors" on the taste and uses of the Paw Paw fruit. -Mary Constantine has a delicious recipe for a Vietnamese Beef Stew. -Chef Shelley Cooper of Dancing Bear Lodge and Terra Mae Appalachian Bistros with a recipe for Osso Bucco. -Crystal Wilson of Turtle Mountain Herb Farm with her United Plant Savers Garden called "Grannie's Garden". -Karin Shankles, winner of the 2015 Cornbread Cook-off and her winning recipe. -A Farmers' Market Minute with "Honey Dew Naturals" from Strawberry Plains, Tennessee. Chef Shelley Cooper of Dancing Bear Lodge Appalachian Bistro in Townsend, Tennessee and Terra Mae Appalachian Bistroin Chattanooga. Chef Cooper is on of the featured Chefs at the Appalachian Food Summit taking place September 26th, 2015 in Abingdon, VA.
SORGHUM! We also visit with Fred Sauceman and his segment about Sorghum. Fred has a brand new documentary that will be featured at the Appalachian Food Summit. The documentary is called "Sunlight Makes it Sweeter A Story of Sorghum". For more information on Fred Sauceman and to get a copy of this documentary, look for Fred on Facebook. Chef John Fleer. I visit with him at his restaurant "Rhubarb" in Asheville, NC. Chef Fleer will be cooking some some yummy goodness at the Appalachian Food Summit. September 26th in Abingdon, VA.
Minde Herbert of Affordably Organic has a healthy twist on the Appalachian favorite "Corn Pudding"
Beans! We visit with several people during this show and talk about Beans. Pole beans, peanut beans, white half runners, and preserving beans. Mary Phillips of Friendsville, Tennessee. Mary is a descendant of The Walker Sisters” from the Greenbrier area of the Great Smoky Mountains National Park. We speak with her about canning wisdom, stories of memories eating with the Walker Sisters, and such. Mary Phillips of Friendsville, Tennessee. She shares with us her tips on canning and stories from her memories of visiting her kin at the Walker Sister cabin in Greenbrier area of the Great Smoky Mountain National Park. Her Grand Daughter Amy Sawyer took this photograph. This Saturday June 6th from 9-10 AM on The Tennessee Farm Table radio show, I visit with Laura Sohn of The Public House, in Knoxville, Tennessee. -Fred Sauceman brings praise to Wayne Scott and his Strawberries. -Minde Herbert @Mindeherbert Has a delightful take on a broccoli recipe. She helps us all eat better on a budget. - Mary Constantine has a story about Chicken Feet you have to hear. Hope you can pull up a chair and sit a spell at our Tennessee Farm Table. May 30 - "Amy on the Road" Appalachian Foods and Chef John Fleer of Rhubard, Asheville, NC. May 9: SORGUHM our feature with Author (and founding member of the Southern Foodways Alliance) Ronni Lundy. Ronni has written a book called Sorghum's Savor. So we are going to talk about Sorguhm mostly on the show. 9 till 10. WDVX.com, and on 89.9.FM in and around Knoxville. Charlotte Tolley of the Market Square Farmers' Market, Knoxville, and Nourish Knoxville and the "MSFM" opening day of May 3rd for the 2015 season. April 11 - Rebecca Williams of "FARM" spoke with us about the opening dates, farmers, products, and locations of this organization's markets for the 2015 season in our area. March 28st - Spring is upon us, and the fish are biting! Let's go fly fishing with Ian and Charity Rutter of R & R Fly Fishing this Saturday on "The Tennessee Farm Table" Radio show. Every Saturday, 9:00 -9:30 am on WDVX.com, 89.9 fm in Knoxville. If you are too busy farming, or fishing and miss it, listen on YOUR time with the "On Demand" tab at WDVX.com. March 14 - Matt Gallaher, co-owner and chef of "Knox Mason" in Knoxville will be our guest this Saturday, March 14th on the Tennessee Farm Table. Matt uses as many local ingredients from local producers as he can in his restaurant, and he loves to celebrate the classic Southern dishes. Hope you can join us for this visit with Matt. If you can't, listen anytime, on your time on WDVX.com, "On Demand" tab, last 2 weeks are archived. March 7th - Jennifer Nicely of River Plains Farm in Strawberry Plains, Tennessee will talk about pasture raised meats, the benefits and nutritional advantages. Fred Sauceman has a pork roast recipe using Westwind Farm meats, and Mary Constantine has a recipe for Vetnamese Beef Stew. February 28th, Preparing the spring garden, and selecting garden seed. We will have our friend John Coykendall talk about his heirloom seeds, his business of seed saving, and where to find this seed. We also talk about where to find hybrid seed, and other varieties to suite your needs. February 21st: Red Eye Gravy & Cornbread. Let’s talk about RED EYE GRAVY and CORNBREAD in the morning! Fred Sauceman has a segment where he regales RED EYE GRAVY. We are so honored to have Fred be a contributor to The Tennessee Farm Table. Did you know he wrote “Corn Bread Nation 5, The Best of Southern Food Writing? Well he did. And he is the man on southern food. We also have chefs from Century Harvest Farm, Shannon Walker, and Beekeeper Judy Odell of Smoky Ridge Apiaries giving their take on cornbread. We are also so fortunate to have Mary Constantine (Food Writer for the Knoxville News Sentinel) as a weekly contributor as well. She shares with us a treasure….her Daddy’s Cornbread Stuffing recipe. We also will hear music from Little Jimmy Dickens, The Carolina Chocolate Drops, and the Stanley Brothers. February 14th: Valentine's Day Treats. Helen and Ellen of "The Love Kitchen" serve our community and feed people who would otherwise go hungry. Hear about how you can become involved, and the important impact this organization has on out community - through food. We also have some sweet treats to tell you about! February 7th: "Ham Meat". We celebrate the pig on this day. Our contributors include: Allan Benton of Benton's Country Mountain Smoked Hams We talk about "Prosciutto", which is a "$10.00" word for country ham sliced thin and fried! http://bentonscountryhams2.com/ Mary Constantine, Food writer for The Knoxville News Sentinel has a segment entitled "Blackberry Ham". Fred Sauceman has a segment about Allan Benton's Prosciutto. And we get to hear a new duet with Gillian Welch and Ralph Stanley. January 31st: Collard Greens - We visit with Bob and Anne Neyland (General Neyland's eldest son and daughter-in-law) about General Neyland's favorite southern foods. We also have visiting chefs heralding the great green of the southern table. Chef Matt Gallaher owner of Knox Mason Restaurant in downtown Knoxville, TN. January 24th: "Peas". Master gardener and seed saver John Coykendall on the importance of saving seeds and southern field peas from his collection. January 17th: Cornbread - We hear about Dr. Joe Johnson's favorite cornbread, and numerous regional chefs talk about how they make cornbread. December 27th - Drew and Bonnie McDonald of "The Plaid Apron", in Knoxville, Tennessee. A real live "farm to table" restaurant that anyone can go to taking holiday orders for desserts. December 20th - Allan Benton of Benton Smoky Mountain Country Hams in Madisonville, TN. Allan talks about his "Prosciutto". A great gift idea for the holidays. December 13th - We visit with Joseph "Leo" Collinsof Blue Bird Christmas Tree Farm in Heiskell, Tennessee. This is a place where you can take the family, and pick out your tree. They also have a craft cottage with local crafts, jams, jellies and honey. The gift items are almost entirely made from our region's bounty by local artisans. December 6th - Beekeepers Coley and Judy O'Dell of Smoky Ridge Apiaries. Judy makes value added crafts for gifts from beeswax and they process some of the finest honey around. You can purchase honey and value added products by the Odells at the following locations, or at their self serve Honey Stand 24 hrs a day at their home. Great local gift idea. Saturday, November 22nd - We will visit with Chef Bruce Bogartz of Icon Restaurant. We talk about Thanksgiving food memories, how he learned baking from his Granny, and his food take with his new venture at Icon restaurant. Saturday, November 15th - We will discussed "Mountain Medicine" with Chrystal Wilson of Turtle Mountain Herb Farm in Rockford, Tennessee. Saturday, November 8th - We discussed fall Squash including pumpkins with Jeff Ross, Garden Manager and Artisan at Black Berry Farm. Saturday, November 1st - We had an encore performance from Shannon Walker, Preservationist, Bee Keeper, and Artisan at BlackBerry Farm, Walland, Tennessee. Saturday, October18th - Our topic was "Persimmons" with Jim Millsaps of Blount County, Tennessee. September 20th - Shannon Walker Preservationist and Beekeeper at Blackberry Farm, Walland, TN. Shannon discussed his work at Blackberry and his preservation of Appalachian food history. September 13th - "Back Yard Sustainability" with your neighbor and, chicken raiser and backyard homesteader, Tiffany Kimbro. July 26, 2014 - Allan Benton, Benton's Smoky Mountain Country Hams, Topic "Ham Meat", Our very first flagship show. My featured guest was Allan Benton, the man on ham, bacon and all things pig. In the images below, you will see some of Amy's past guests. Amy with Allan Benton -Photo - Amy Campbell. John Coykendall shared recipes, stories and facts about the heirloom Butterbean seed he has preserves, shares and promotes. John Coykendall is a master gardener, seed saver, story collector, person from a different time, and celebrity of the growing world John Coykendall. Guest: Joe Johnson, President Emeritus, University of Tennessee Dr. Joe Johnson and Amy discussed our 3rd show the importance of 4-H, and how to become involved, and some of Dr. Johnson's favorite foods. In addition to Dr. Johnson's numerous activities, he has served on the Board of Directors of the Tennessee 4-H Foundation and is very passionate about our UT Ag Department. Amy with Allan Benton October, 2014. Heirloom seed saver John Coykendall at my kitchen table, sharing his knowledge of seed saving with us. He is here writing down histories, stories, and names of some of his collection of filed peas. My guest was Colleen Cruze Bhatti, the topic was Buttermilk. Miss Colleen will talked with us about why Cruze Farm Buttermilk is so good, the nutritional value of buttermilk, and her personal style of farming. Shannon Walker is the preservation kitchen at Blackberry Farm. Minde Miller Herbert of Affordably Organic.